Branching Out Adventures Outdoor Pursuits CentreSet within a beautiful piece of Sussex oak woodland, Branching Out Adventures is a unique adventure centre for children and adults who like a hilarious challenge. Treetop Ropes courses will test agility and balance. Zipwires, Giant Swing and Climbing Wall will add an adrenaline rush to your visit. New this summer is Bounce About, an amazing suspended net climbing experience. Activities for children aged 6 years and up will keep them entertained while adults can have a go, too, or just relax in Cyril’s Café with excellent coffee or a cuppa. Set within a beautiful piece of Sussex oak woodland, Branching Out Adventures is a unique adventure centre for children and adults who like a hilarious challenge. Treetop Ropes courses will test agility and balance. Zipwires, Giant Swing and Climbing Wall will add an adrenaline rush to your visit. New this summer is Bounce About, an amazing suspended net climbing experience. We cater for individuals at weekends and during school holidays, or schools can bring a whole year group for a day of amazing enrichment and learning activities. We can mould our days around almost anyone. 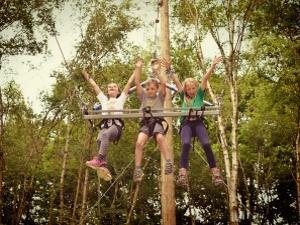 Latest admission times onto the ropes courses is 3pm. No entry fee. Prices charged for activities booked individually.